The Arctic marine ecosystem depends on sea ice—algae growing under sea ice are consumed by crustaceans and fish, which are in turn consumed by seabirds. However, the ecosystem is changing in response to rapid sea ice melting. Decreasing amounts of sea ice will also increase development and tourism in the Arctic. These threats to ecosystem health make conservation a priority. To create a baseline for use in future climate change studies that will guide conservation efforts, Wong et al. observed seabird distribution on and over marine areas in the North American Arctic from 2007 to 2012 during July and August. The North American Arctic is home to millions of seabirds, including murres, auklets, petrels, puffins, seagulls, and sandpipers. Seabird populations can be indicators of ecosystem health because of their wide variety of foraging modes. 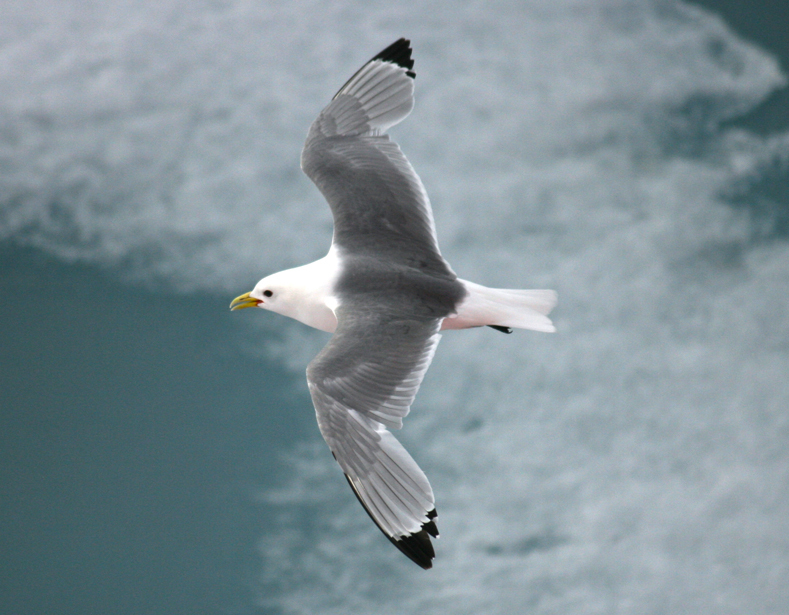 The three foraging modes of Arctic seabirds include surface feeding, plunging, and diving. Surface feeders catch prey from the surface of the water, plungers catch prey by dipping into the water from flight, and divers catch prey by diving into the water from the surface. For the purpose of the study, the team divided the North American Arctic into west and east sections using the meridian passing through Kugluktuk, Nunavut, as the dividing line. Two vessels conducted seabird surveys in July and August 2007–2012. The western vessel transited between Victoria, British Columbia, and Kugluktuk, and the eastern vessel transited between St. John’s, Newfoundland and Labrador, and Kugluktuk. The team recorded the number and species of seabirds observed on the sea surface within a 300-meter-wide transect. Instantaneous counts (e.g., rapid visual surveys of all the creatures counted in, say, 1 minute) were used for birds flying within 300 meters of the research vessel. Citation: Minnehan, C. (2015), Survey shows where Arctic marine bird populations thrive, Eos, 96, doi:10.1029/2015EO025309. Published on 4 March 2015.